Yes, I am naming my hives after Star Trek planets. And their inhabitants have arrived! 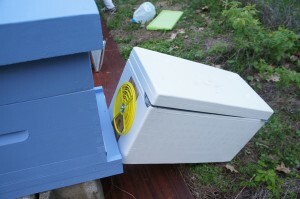 Installed two hives this week; I’ll break the installation description into two posts. Vulcans first! Picked up my styrofoam nuc around 4 on Wednesday. 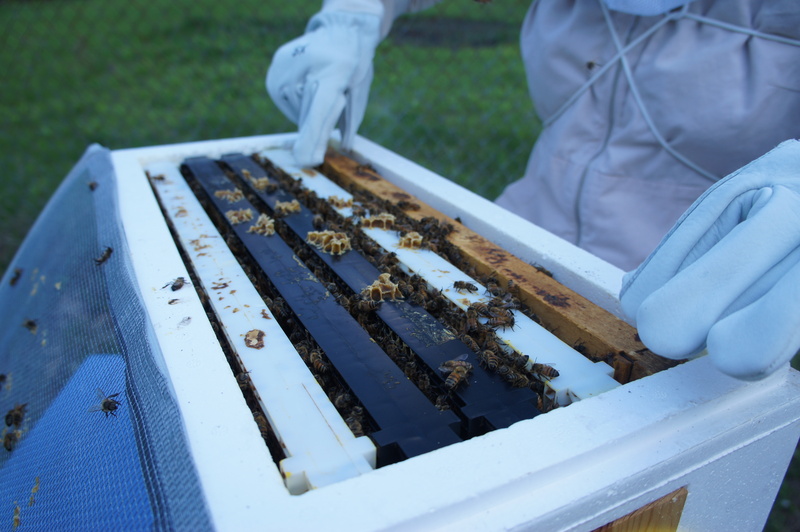 (A benefit from buying a nuc from BetterBee: I now have a nice nuc box I can use when I want to split hives in the future.) The bees were pretty quiet on the drive home. 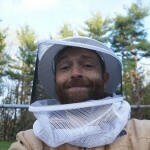 Suited up in my bee gear, was promptly laughed at by my husband, and headed to the hives (with said husband taking photos from beneath a second veil). As a side note: My “gear” pretty much consists of a veil and gloves. It may look like I have a full bee suit on, but it’s really just a light-colored jacket and pants I picked up at Goodwill for about $3 each. And I’ll likely chuck the gloves pretty quickly: They make it really difficult to handle frames and easier to squish bees. First things first: Smoker fired up and ready to go. 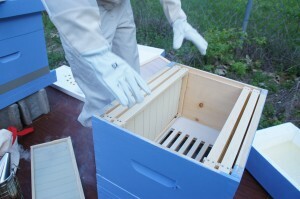 Place five empty frames into the hive, leaving space in the middle for the five from the nuc box. Pour sugar syrup into the hivetop feeder. This will build up their strength until more flowers open for them to harvest nectar from. Time for the bees! The bees were all over the tops of the frames, so I hit them with a few puffs of smoke to drive them down into the frames–makes it easier to pick up the frames without bees in the way. At this point, I just lifted each frame out of the box and placed it into the hive, making sure the frames stayed in the same order when I moved them. That was pretty much it! I did have some trouble figuring out how to put the hivetop feeder (which has a flat, solid bottom) back on the hive 1) without squashing the bees and 2) without leaving a gap because of the pollen patty (for protein) and grease patty (for mite control). 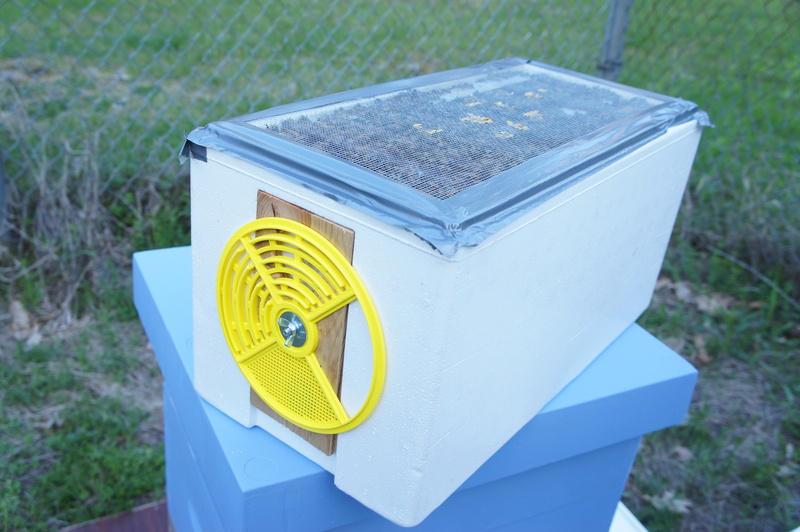 Also realized that there was some comb stuck on the tops of some of the frames, which wasn’t allowing the feeder to rest properly. So I had to scrape that off. 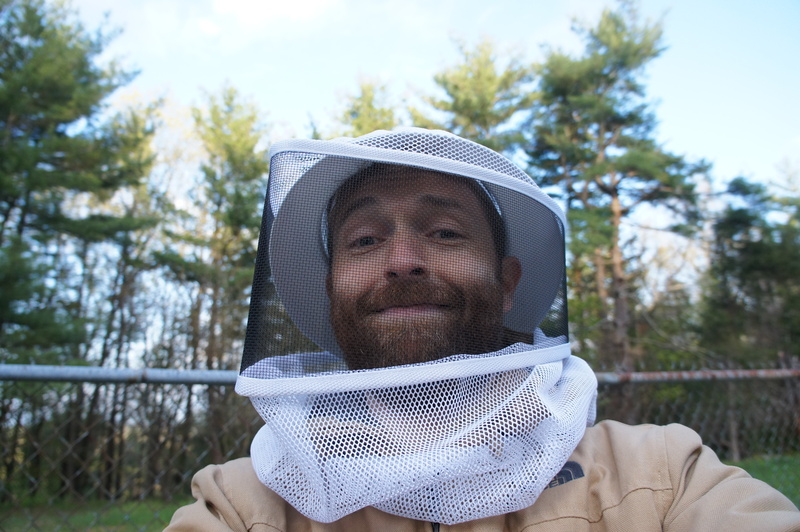 Of course, in my excitement to get the bees into the hive before it got too dark and cold, I forgot my most important piece of equipment (besides the veil): the hive tool. This is pretty much just a small, sturdy pry bar, good for prying apart frames–and scraping comb off the tops of frames. Hubby was good enough to run back to the house to get it for me. In the future, I plan to get some sort of organizer to keep all my bee stuff together, perhaps similar to what I use for my gardening tools. 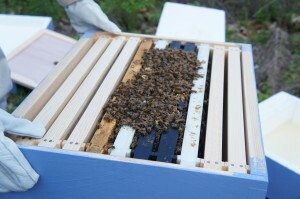 Got the comb scraped off, flattened the patties some more, and smoked the bees back down into the hive. Got the feeder on ok after that, but still ended up squishing some bees. There must be a better way to do that. There were some bees left in the box, so I just left it outside the hive entrance: They’d smell their queen soon enough and move into the new hive. Normally, this would have been fine. But later I started thinking about how cold it was and that if they didn’t get into the hive soon enough, they’d probably freeze overnight. So I geared back up, and with the help of hubby holding flashlights, opened the hive again and dumped the remaining bees into the hive, using my bee brush. It’s probably good I did: The bees left in the nuc box were already clumped together trying to stay warm, and I don’t know if there were enough of them to stay warm. 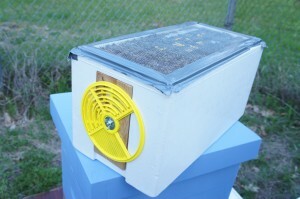 Note: It isn’t good for the bees to open the hive when it’s so cold, nor is it a great idea to do it at night. Oh, well. Live and learn. I have to say, it wasn’t scary at all. I expected I’d be a bit apprehensive being around all those bees (~10,000 or so), but I really wasn’t at all. There were obviously some bees flying around and some that stayed in the box, but the vast majority of them just stayed on the frames as I moved them from one box to the other. With the veil and gloves, I wasn’t going to feel it even if they did sting (which I don’t think they did, anyway). It was just a really cool experience to be holding thousands of bees in my hands! I’ll have a video of the installation up at some point. 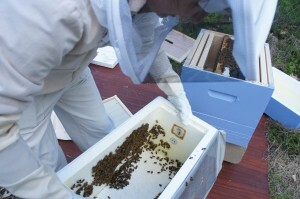 It’s cool to see how you’ve installed a nuc; my bees came as the big package-type. I’m still somewhat terrified that the queens are dead or were killed since I haven’t been able to spot them yet. Yeah, the gloves came with my “beginner’s kit,” and I’m ready to hang them up for good. They’re terribly awkward. I’ll have to try something else! The nuc was pretty darn simple to install, though I was afraid I might have squished the queen or dropped her on the ground or something. Checked 3 days later and saw eggs, though, so she’s alive and well! My second hive was from a package. I just installed them last Saturday, so I won’t be able to check on them until this Saturday. Hopefully they’ve released the queen. 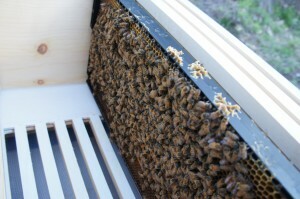 They’re nowhere near as active as my nuc hive, but I’m guessing that’s to be expected. They’re starting to bring back some pollen, so I’m hoping that means there’s some brood in there to feed.